Misuse of Electricity Essay. Welcome to our website. This is the one of the best and an unlimited the source of Essay and Paragraph. 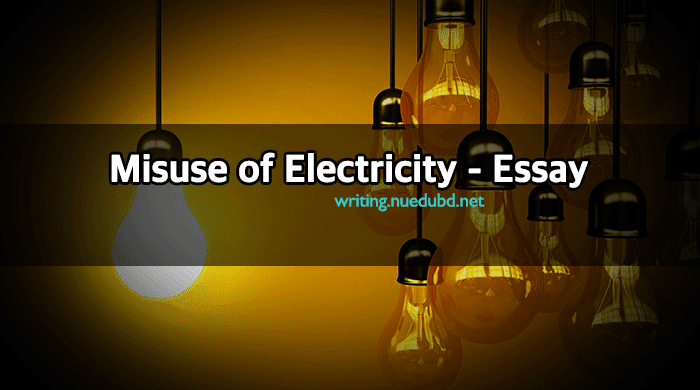 Now NU EDU BD writing section sharing the most useful Misuse of Electricity Short Essay for you. I hope you'll like it. Education is one of our basic rights. This is very short and easy essay for you. Now check this out Short composition on Misuse of Electricity Essay for you. Introduction: Bangladesh is a small country with growing problems. Among all problems, misuse of electricity is a great one. Development is impossible without electricity and development to go side by side. But this electricity is misused in many ways. The misuse is going from bad to worse. All are getting concerned about this problem. Misuse: Many causes are responsible for the misuse. Luxurious shops use many bulbs and fans. They also use air-conditioners. They do it attract customers. During some festivals, all most all the shops use colorful bulbs. During some ceremonies like marriage ceremony, marriage day anniversary and birth day party, bulbs are used in excess. Many of us keep fans and bulbs on unnecessarily. Our so-called leaders enjoy electric connection illegally many mills and factories also use it illegally. Some big guns use it but do not pay the electric bill. Thus electricity is misused in many ways. Effects: The effects of the misuse are many. For the misuse of electricity, the country suffers an acute shortage of power. There are frequent power cuts across the country for it. Mills and factories cannot run. The misuse of electricity slows down the normal production. So the country faces an acute shortage of production. For this misuse, the farmers do not get enough power during irrigation. Thus it hampers our agriculture. This leads the country food shortage Students do not get the light to study. So they suffer a lot. The dying patients, sufferings know no bounds. In fact, the overall development of the country is hampered. Ways of the solution: Immediate steps should be taken to stop the misuse. At first, we have to more conscious. Public awareness is a must. The illegal users must be punished. All the illegal connections must be disconnected. The vigilant watch is needed on mills and factories. Conclusion: In fine, we can say that the misuse of electricity is a great problem. Only the proper use of power can ensure the overall development of the country. So it should be solved at any cost. It is high time we solved the problem. Conscious people should work together with the government in this regard. Otherwise, we all fall into a greater danger.